Taking readings of brain activity before patients go for surgery could help doctors give a more accurate dose of anaesthetic, researchers suggest. At present, a patient's body weight is the main factor in deciding the dose. But a University of Cambridge study indicated people with high levels of brain connectivity or "chatter" needed a larger dose to put them under. And this could help doctors work out exactly the amount of anaesthetic a patient requires to become unconscious. The study, published in PLOS Computational Biology, looked at how the brain's electric signals changed in 20 healthy volunteers given a common anaesthetic called propofol. They were then asked to press different buttons when they heard different sounds. After reaching the maximum dose, some were still pressing buttons, while others were unconscious. The "chatter" or connectivity between areas of the brain was much more pronounced in those who were still conscious. And when the research team looked at brain activity when the participants were awake, using readings from an electroencephalogram (EEG), they found similar differences. Lead study author Dr Srivas Chennu, from the University of Cambridge department of clinical neurosciences, said: "The greater the network activity at the start, the more anaesthetic they are likely to need to put them under." He said brain "chatter" was not a measure of brain power. "It varies from day to day as well as from person to person," he said. "It can be related to the amount of coffee you've drunk or how much sleep you've had." The research was still in its early stages, he added. Dr Richard Marks, vice-president of the Royal College of Anaesthetists, said: "It's actually very difficult to tell when a patient is asleep or not. "We need something that is reliable, specific and easy-to-use to help us." 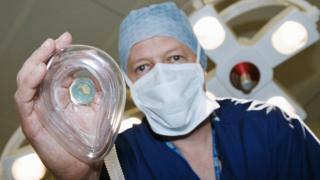 Administering too much anaesthetic could cause side-effects, including heart attacks and strokes, he added. Thanks for all your labor on this web page. My niece enjoys going through internet research and it’s really simple to grasp why. We all learn all regarding the dynamic way you deliver simple tactics through this blog and therefore attract participation from people on this subject matter while our own princess is without question learning a whole lot. Take pleasure in the remaining portion of the year. You’re the one performing a really good job. you made to make this particular post incredible. Life Is an Illusion and Illusion Is Everywhere..